Types of equinus, surgical management for equinus involving the Y- talocalcaneal osteotomy supplementing an external fixation device is presented. A case report is introduced involving surgical correction of a 53 year old male who had a severe equinus flat top talus with mild varus secondary to clubfoot surgery. Treatment included surgical correction utilizing Steindler stripping, Achilles tendon lengthening, and a rather rare Y- osteotomy of the calcaneus and talus with the use of a multiplaner external fixator in an unconstrained system to correct the equinus and varus deformity. Slow distraction was performed in order to decrease the risks of having neurovascular injury, soft tissue injury, and shortening of the foot. After months of follow-up, there was good healing of the osteotomy sites and the patient had a plantigrade foot. Key words: Clubfoot, Rigid Equinus, Flat top talus, Y-Osteotomy, External fixation, Distraction Osteogenesis, Ilizarov method. Ankle joint equinus can be divided into a three types; soft tissue, osseous and a combination of the two. Soft tissue equinus alone can be easily repaired, but when multiple deformities occur such as clubfoot, it can complicate the treatment. Traditionally, correction has been managed through arthrodesis and extensive soft tissue release. Treatments for soft tissue ankle equinus include procedures such as splinting, tendo-Achilles lengthening, gastrocnemius recession, and rare deformities such as accessory soleus release. [10,13] Neurovascular, soft tissue problems and shortening of the foot may occur with traditional techniques. Also, prior surgeries may make the surgical management of the foot deformities more difficult later in life. An Ilizarov external fixator can be used to correct equinus and it can be applied in two ways; constrained and unconstrained. The constrained technique places the axis of rotation at a planned anatomical axis of the joint. The constrained technique can correct deformities within the joint unlike the unconstrained that keeps the natural axis of rotation. The unconstrained technique places the axis of rotation around the natural axes of the joint. The unconstrained technique requires distraction of the ankle joint before an attempted correction. The Ilizarov external fixator can be used to correct equinus without an osteotomy, only when the equinus is soft tissue in nature. Only correcting the soft tissue deformity with an Ilizarov frame has a high recurrence rate. When dealing with an osseous equinus an osteotomy must be performed and Ilizarov used the process called distraction osteogenesis to correct the deformity. “Gradual distraction of the soft tissues and bones enables reshaping of the foot.”  The Ilizarov technique can fix these deformities with minimal incisions. The downside to this is the patient has an external fixator for several months. During this time the patient may bear weight on the area which has an advantage over internal fixation. Another advantage is during osseous correction it can also correct for soft tissue deformities at the same time. There are three main types of Ilizarov rearfoot osteotomies including the U, V and Y osteotomies. The Y- osteotomy is the least published of the three. The Y is an osteotomy through the neck of the talus and an osteotomy of the posterior calcaneus below and parallel to the subtalar joint making an apex in the anterior calcaneus and then an osteotomy plantarly thus creating the shape of a “Y”. The Y- osteotomy has the same implications as the V- osteotomy except it doesn’t elongate the foot as much. The Y- osteotomy with external fixation allows small changes each day to allow the new bone to form and correct the deformity. This osteotomy allows correction of complicated equinus cases. Which osteotomy is chosen depends greatly on the surgeons’ experience. A 53 year old male was seen in the office due to severe pain around the sub right 4th and 5th metatarsals. 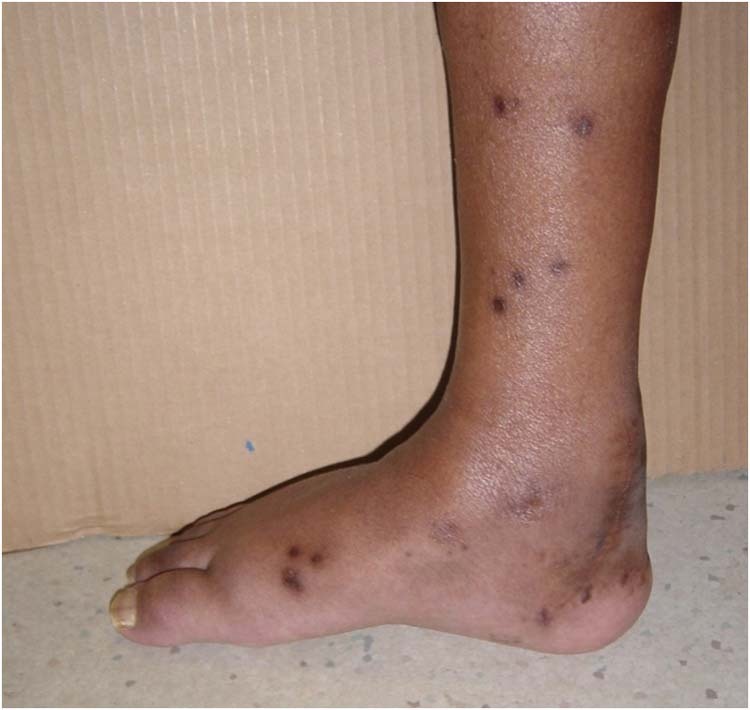 The patient had an equinus deformity of the right lower extremity with varus deformity. (Figs.1A and 1B) His past surgical history was significant for club foot surgery when he was 4 years old, which still left him ambulating on the ball of his right foot. The rest of the history was unremarkable. 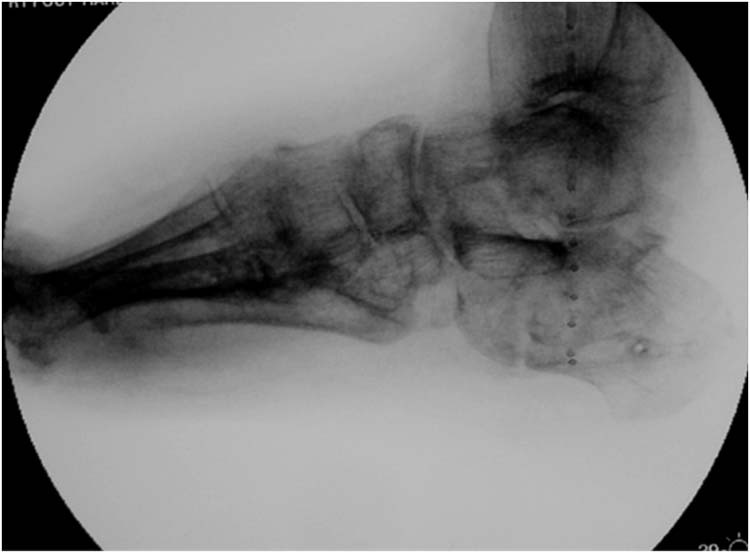 Figure 1A and 1B Preoperative photo (A) and radiograph (B) showing ankle equinus deformity. Physical exam showed that he had scar tissue around the medial, lateral, and posterior heel on the right foot. The positioning of his right lower extremity included a tight contracted Achilles tendon that correlated with a rigid equinus deformity, varus of the foot with subtalar joint stiffness with no range of motion at the mid foot, rear foot and ankle. Also, there were contractures of all the digits. There was no leg length discrepancy noted and the length of the foot was within normal limits. The patient had difficulty wearing shoes and could only wear sandals. There was increased pain under the right 4th and 5th metatarsophalangeal joints due to the excessive pressure while ambulating secondary to the rigid equinus and inversion of the foot. This, in effect, was placing too much pressure on his 4th and 5th metatarsal heads. The procedure that was performed included a Steindler stripping, an Achilles tendon lengthening, talar and calcaneal Y-osteotomies, plantar tenotomy of all five digits, and the application of an Ilizarov external fixator. The patient was prepped and draped in the usual standard manner. No tourniquet was applied. 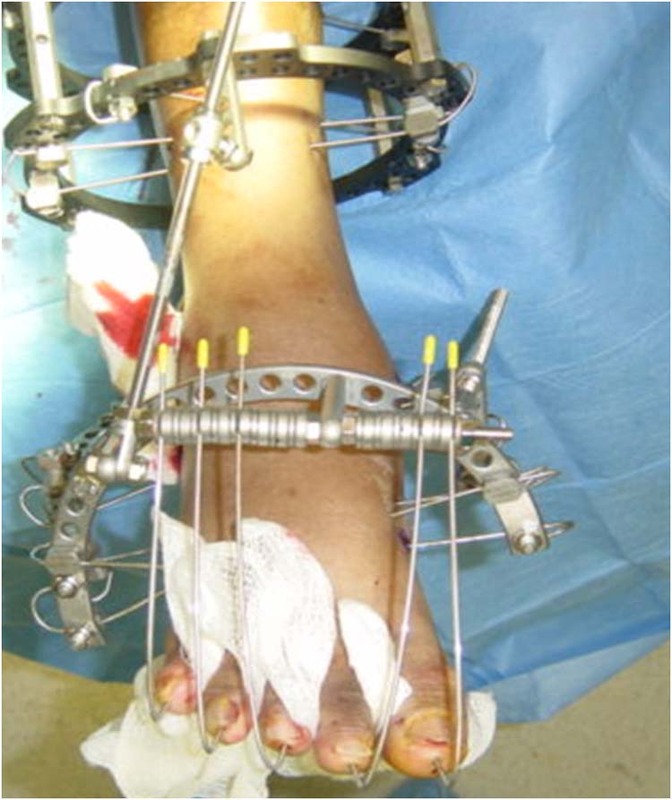 A # 15 blade was used to perform a percutaneous tendon lengthening of the Achilles Tendon. The foot was only able to dorsiflex several degrees due to the severity of the deformity from negative 45 to negative 40 degrees. Along the plantar medial calcaneus a Steindler stripping was then performed. This helped release all the fascial and muscular contractions on the plantar foot from the calcaneus. A prophylactic tarsal tunnel release was also performed by transecting the laciniate ligament. Two tibial rings were then applied to the lower leg. One half-ring was applied to the calcaneus and one half-ring was applied to the distal foot. All wires were then tensioned appropriately. The calcaneal half-ring was attached to the posterior tibial ring. 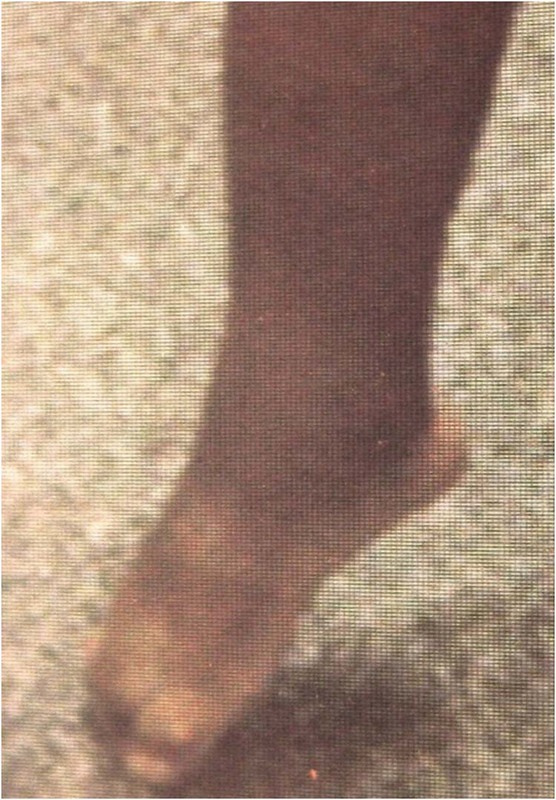 The distal foot half-ring was then connected to the anterior tibial ring. Figure 2 Intra-operative radiograph of the Y- osteotomy. The left side of the Y is the Talar neck osteotomy, the right side of the Y is the calcaneal osteotomy below the subtalar joint and the stem of the Y osteotomy is located at the distal calcaneus. Figure 3 Initial frame placement at the time of the surgery. Figure 4 Note the rod rotating the distal ring out of varus and dorsiflexing it. Figure 6 The post-operative radiograph. At one week, the following manipulations to the bones in the external fixator were initiated: 1) distraction of the calcaneus towards eversion and inferior displacement, 2) rotation of the distal foot towards eversion and dorsiflexion, 3) distraction of the forefoot from the rearfoot. Figure 7 More rods were applied for more distraction at 3 weeks after surgery. Figure 8 At 8 weeks , the patient had more bars and rods added with frame manipulation. Figure 9 At 5 months the frame was removed and the patient was placed in a below the knee cast. Figure 10 At 6 months, the patient had his foot plantigrade and was full weight bearing in a custom made AFO. Overall, the patient was able to ambulate with the heel on the ground with minimal pain; however, did not have much range of motion at the ankle or foot. All the pain under the lateral forefoot resolved. The patient was satisfied with his plantigrade foot and able to ambulate with a custom AFO. There are multiple surgical procedures available for correction of acquired ankle equinus, soft tissue as well as bone procedures. [1,2,4] When this deformity becomes fixed it poses a challenge to many foot and ankle surgeons due to soft tissue contraction and bony adaption and requires a combination of soft tissue and bone procedures. [1,2,4] Flexible deformities can be treated with manipulation methods thus preventing surgery. Despite such complications, the Ilizarov technique remains an effective and safe tool for complex lower limb reconstruction surgery. It allows corrections in all planes at a rate that can be tailored to the deformity without the constraints of traditional methods. When looking back at the literature regarding the Y- osteotomy there is not much to be found. Our case presentation is unique that to our knowledge there are no other journal articles on which a y calcaneal osteotomy is used in conjunction with an Ilizarov distractor. Furthermore there is close to no literature regarding the Y- osteotomy. In the literature the main focus has been on correcting the structural equinus foot by using the V. [16,17] Also there has not been another study in which the y osteotomy is used in conjunction with the Ilizarov distractor. In our case study we found that the Y- osteotomy allows for correction of a severe deformity while minimizing neurovascular and soft tissue complications as well as avoiding excessive shortening of the foot as is many times encountered with traditional techniques. In this case study, we presented a rigid equinus foot that was corrected with the use of a Y – osteotomy along with the use of Ilizarov methodology. There is not much literature about the usage of the Y – osteotomy even though it has three main advantages which are: faster consolidation, skin alterations are easier to contain, and there is less chance of calcaneal-cuboid diastasis. Furthermore, the Y – osteotomy avoids excessive lengthening of the foot. Correction of severe foot deformities with the Ilizarov method is technically difficult but when used with the Y – osteotomy, differentiated correction between the hindfoot and forefoot can be applied. 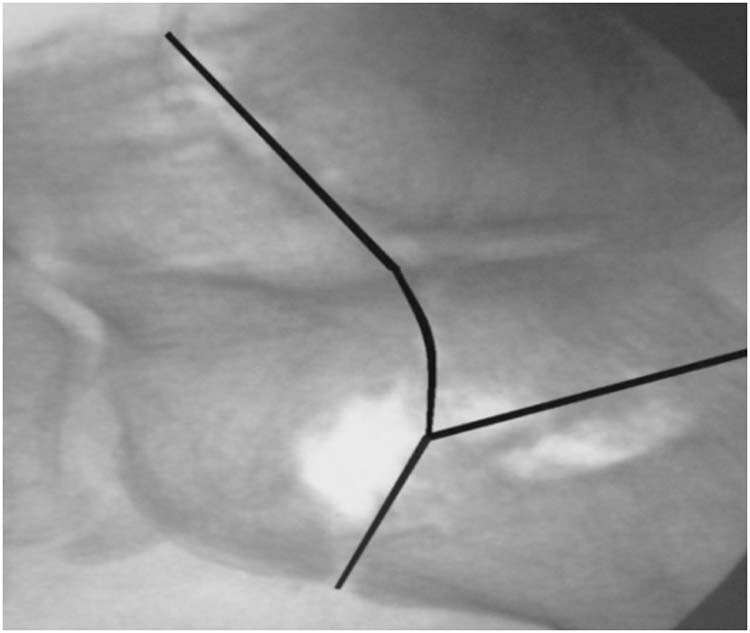 In the case study it was successfully shown that the Y – osteotomy allows for correction of a severe deformity while minimizing neurovascular and soft tissue complications as well as avoiding excessive shortening of the foot as is many times encountered with traditional techniques. The final result was a plantigrade foot. Thus, the Y – osteotomy through the talus and calcaneus with distraction osteogenesis using the Ilizarov methodolgy is an effective surgical procedure in correcting rigid equino-varus foot deformities. 1. Banks AS, Downey MS, Martin DE, Miller SE. McGlamry’s Comprehensive Textbook of Foot and Ankle Surgery. Philadelphia, Lippincott Williams & Wilkins, 2001. 2. Coughlin, Michael J, Roger A. Mann, Charles L. Saltzman. Surgery of the Foot and Ankle. Philadelphia, Mosby 2007. 3. Digiovanni CW, Holt S, Czerniecki JM, Ledoux WR, Sangeorzan BJ. Recurrence after correction of acquired ankle equinus deformity in children using Ilizarov Technique. Strategies Trauma Limb Reconstruction 3: 105-108, 2008. 4. Emara Khaled M, Allam Mohamed Farouk, ElSayed Mohamed Nabil MA, Ghafar Khaled Abd EL. Recurrence after correction of acquired ankle equinus deformity in children using Ilizarov technique. Strat Traum Limb Recon 3:105-108, 2008. 5. Easley, Mark E., Wiesel Sam. Operative Techniques In Foot and Ankle Surgery. Philadelphia, Lippincott Williams & Wilkins 2011. 6. Freedman JA, Watts H, Otsuka NY. The Ilizarov method for the treatment of resistant clubfoot: is it an effective solution? J Pediatr Orthop 26:432–437, 2006. 7. Guyton G, Saltzman C. The Diabetic foot. JBJS 83A: 1083-1096, 2001. 8. Ilizarov GA. Transosseous osteosynthesis. Berlin/Heidelberg: Springer-Verlag, 1992. 9. Kirienko Alexander, Villa Angelo, Calhoun Jason H. Ilizarov Technique for Complex Foot and Ankle Deformities. Marcel Dekker, Inc, 2004. 10. Kishta WE, Mansour EH, Ibrahim MM. The accessory soleus muscle as a cause of persistent equinus in clubfeet treated by the Ponseti method : A report of 16 cases. Acta Orthopaedica Belgica 76: 658-662, 2010. 11. Kocaoğlu M, Eralp L, Atalar AC, Bilen FE. 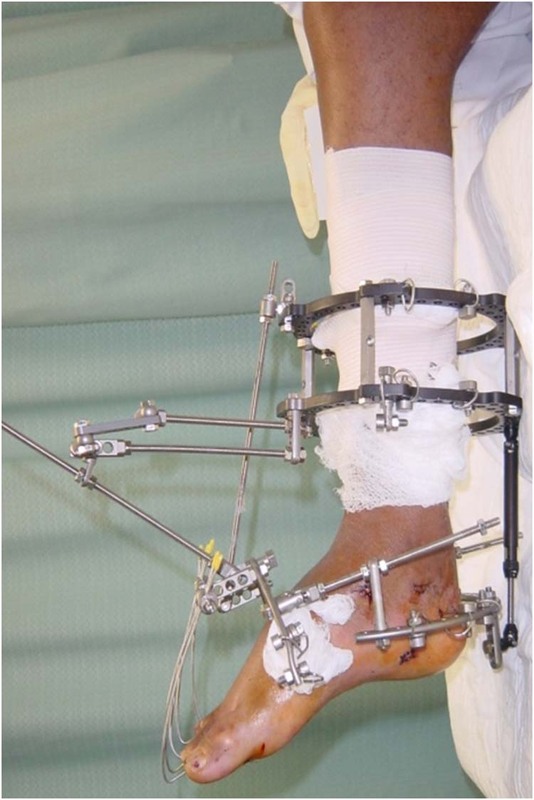 Correction of complex foot deformities using the Ilizarov external fixator. J Foot Ankle Surg 41: 30-39, 2002. 12. Laughlin RT, Calhoun MD. 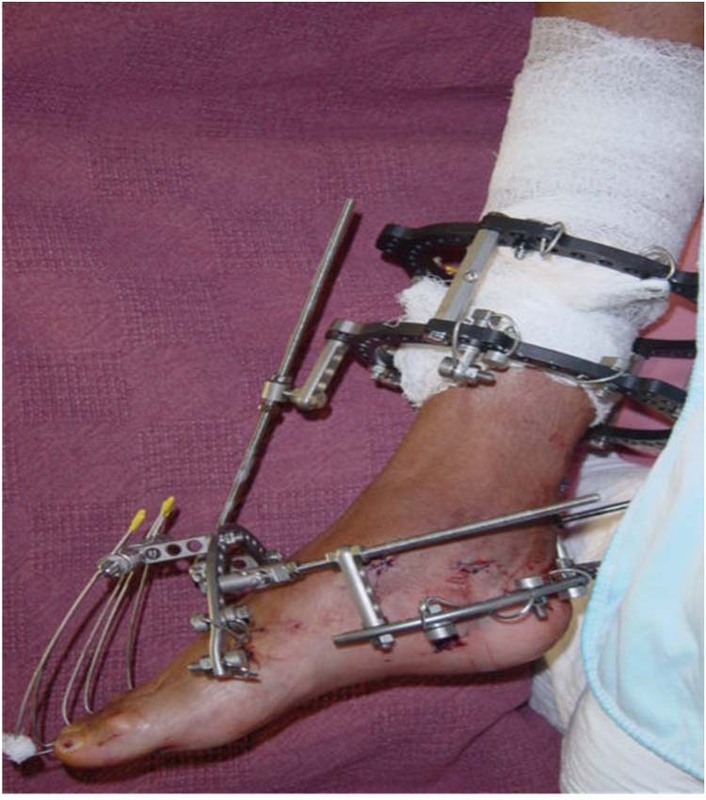 Ring fixators for reconstruction of traumatic disorders of the foot and ankle. Orthop Clin North Am 287-294, 1995. 13. Lopez A, Kalish S, Mathew J, Willis FB. 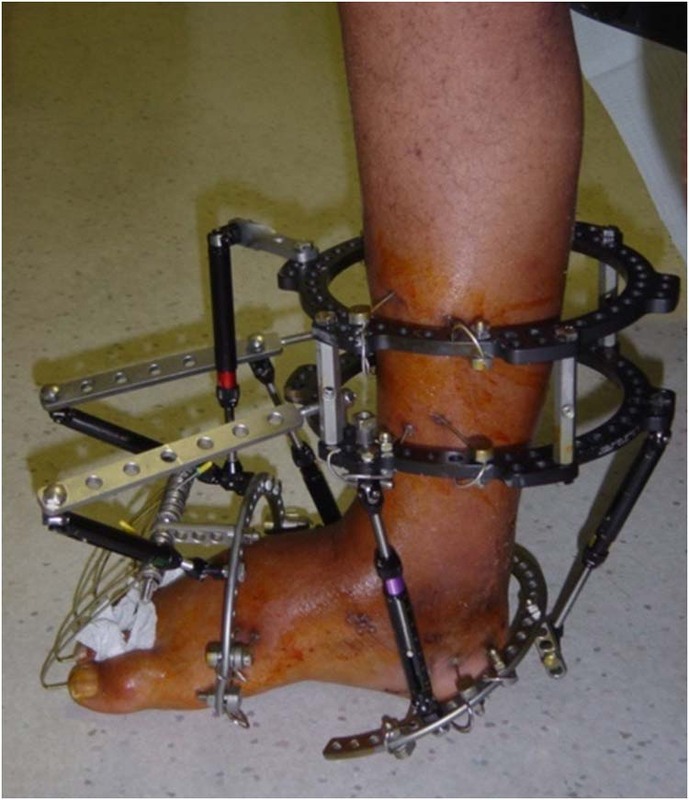 Reduction of ankle equinus contracture secondary to diabetes mellitus with dynamic splinting. Foot Ankle Online Journal. 3 (3):2, 2010. 14. Mendicino RW, Murphy L J, Maskill MP, Catanzariti AR, Harry P. Application of a constrained external fixator frame for treatment of a fixed equinus contracture. 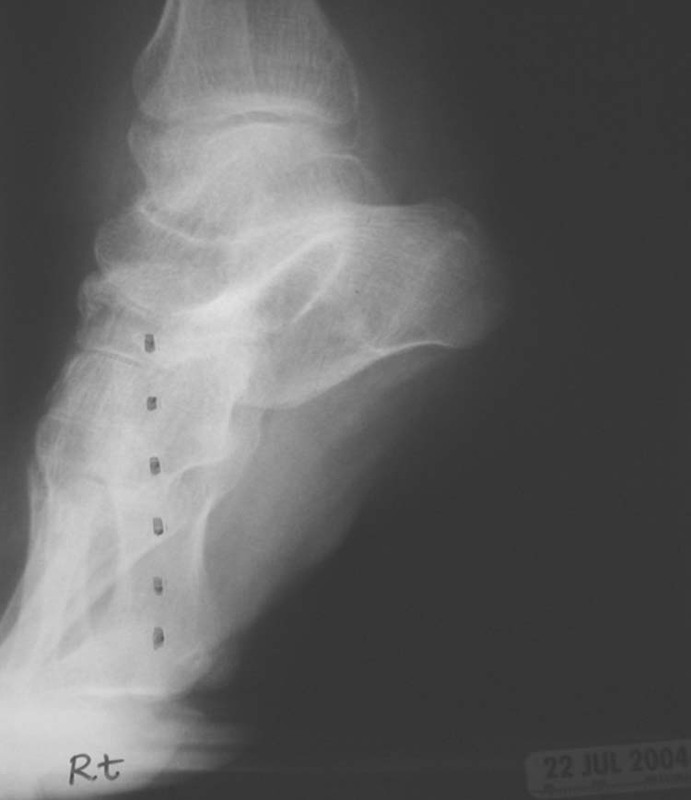 J Foot Ankle Surg 47: 468-475 , 2008. 15. Galli M , Cimolin V, Crivellini M, Albertini G. Gait analysis before and after gastrocnemius fascia lengthening in children with cerebral palsy. J Appl Biomaterials Biomechanics 3: 98-105, 2005. 16. Segev E, Ezra E, Yaniv M, Wientroub S, Hemo Y. V Osteotomy and Ilizarov technique for residual idiopathic or neurogenic clubfeet. J Orthopaedic Surg 16: 215-219, 2008. 17. 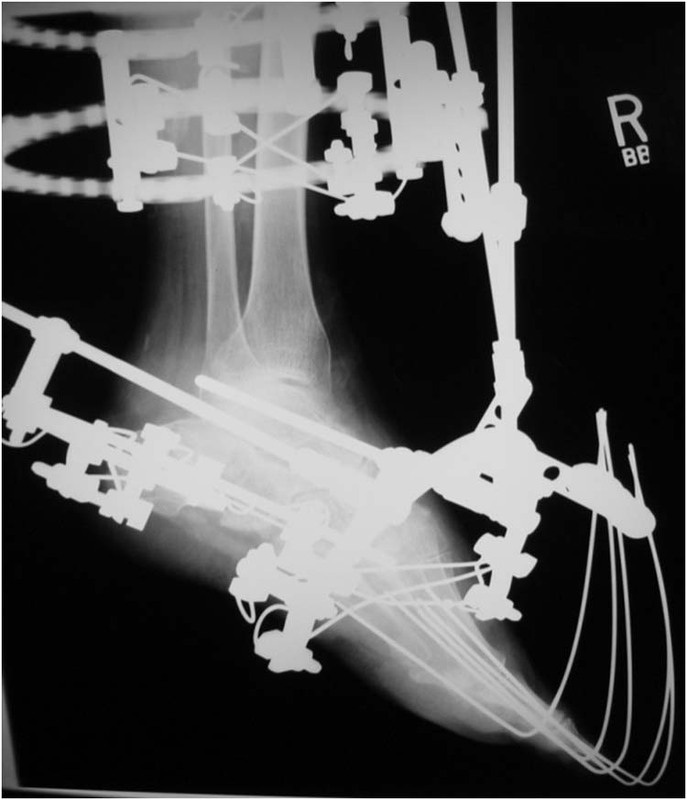 Shalaby H, Hefny H. Correction of complex foot deformities using the V-osteotomy and the Ilizarov technique. Strat Traum Limb Recon 1: 21-30, 2007. 18. Spielberg Parratt Dheerendra Khan Jennings Marsh. Ilizarov principles of deformity correction. Annals of The Royal College of Surgeons of England 92: 101–105, 2010. 19. Gerhardt S, Vinay S, Bernhard ZE, Uitz C, Wolfgang L. Complex foot deformities associated with soft-tissue scarring in children. Journal Foot Ankle Surg 40: 42-49, 2001. 20. Theis JC, Simpson H, Kenwright J. Correction of complex lower limb deformities by the Ilizarov technique: An audit of complications. J Orthopaedic Surgery 8: 1448-1552, 2000. 21. Utukuri MM, Ramachandran M, Hartley J, Hill RA. Patient-based outcomes after Ilizarov surgery in resistant clubfeet. J Pediatr Orthop B 15:278–84, 2006. 2 PM&S 36, R3 (Foot and Ankle Medicine and Surgery) Doctors Hospital of West Covina. 3 PM&S, R2 (Foot and Ankle Medicine and Surgery) Doctors Hospital of West Covina. 4 PM&S, R1 (Foot and Ankle Medicine and Surgery) Doctors Hospital of West Covina. 5 PM&S, R1 (Foot and Ankle Medicine and Surgery) Doctors Hospital of West Covina. This entry was posted in Uncategorized and tagged Club foot, external fixation, External ring fixator, Ilizarov method, rigid equinus, Uncategorized, Y-Osteotomy. Bookmark the permalink.